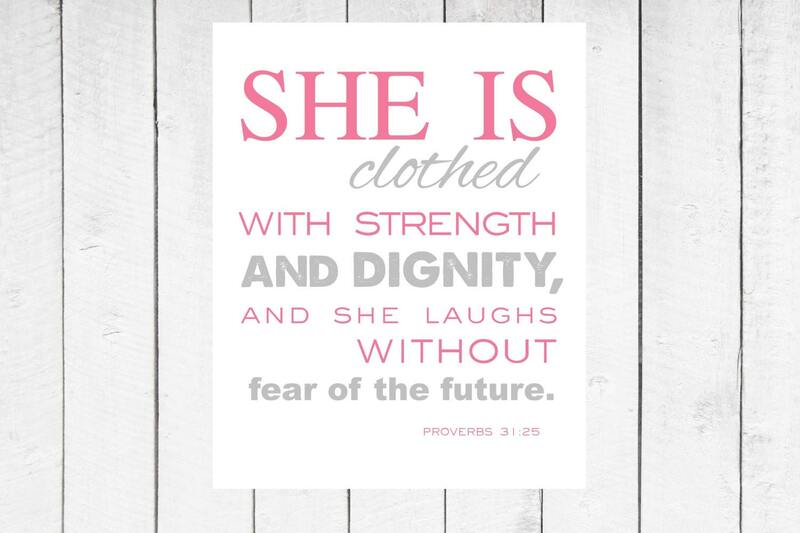 Proverbs 31:25, available here as a INSTANT DOWNLOAD in pink and gray. This is a INSTANT DOWNLOAD. Both the jpeg (300 dpi) and pdf files will be available immediately after purchase on Etsy for you to print at home or send to a local printer. THIS LISTING IS FOR THE DIGITAL FILES ONLY. NO ITEMS WILL BE SHIPPED. INSTANT DOWNLOAD - You will receive both the 8x10 high resolution (300 dpi) JPEG & PDF files. You may print as many times as you would like. If you would like to turn this print into a custom digital file you may be interested in this listing.